People living in the cities usually long to escape from their busy lives. However, it isn’t possible for all of us, all the time, to leave everything and go on a vacation. But as and when the opportunity arises, we try and make the most it. After being in the city for too long, I finally managed to squeeze in a small trip to a comparably small village in the Himalayas; to a hamlet called Bir. Bir is situated in Kangra valley in Himachal Pradesh at just a couple of hours drive away from the now popular towns of Dharamshala and McLeodganj. I hadn’t heard much about Bir before I visited the place and knew nothing about it except its popularity for Monasteries and Para Gliding. There are no direct buses to Bir from Delhi. I took an overnight bus to Baijnath, which is the nearest town to the village and from there on, one has an option to take a local bus or book a taxi. I chose to take a bus as it was considerably cheaper and allowed me to enjoy the view of the valley. Finding an accommodation in Bir can be tricky. After getting down at the bus stop, I walked around the lazy streets of the village market, ideal for a stroll otherwise, looking for a hotel or a hostel. 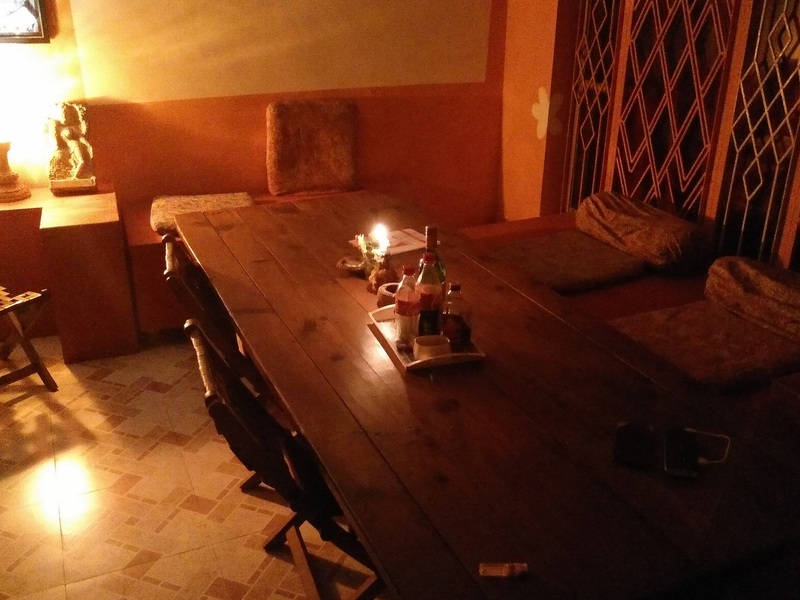 After asking the locals and getting lost on the streets a couple of times, I finally found a place to crash in Chougan, which is just next to Bir. I rested for a while after the 13-hour long journey. Then I set out on the Monastery tour. A few of them are situated in Chougan itself and can be covered on foot. But a couple of major ones are located away from whatever hustle the village has, at an even more peaceful location; making it ideal for meditation and also for escaping life as it brews everywhere around. My first visit was to Palpung Sherabling Monastery, located in Bhattu, East of Bir. The road leading up to the monastery is in itself peaceful with hardly any vehicles on the way. The trees alongside the road are laced with Tibetan prayer flags near the Monastery which, to me at least, felt their way of marking the location of the Monasteries and Stupas. When I entered the Monastery, there was not a single sound to be heard. Seldom in my life have I been bereft of sound and this was one of those times. Lamas, young and old, walked around doing their daily chores but none of them made the slightest noise. On inquiring, I was informed that more than a week long prayer had just ended and that explained the silence. I was allowed to view their prayer hall from inside and calling it magnificent would be an understatement. It consisted of a tall, golden statue of Lord Buddha. After soaking in the quiet that Palpung Sherabling had to offer, I headed to Dzongsar Khyentse Chökyi Lödrö College of Dialectics. Needless to say, the delightful views of the valley along the road were all one could take notice of along the way. On reaching this college/Monastery, I was quite convinced it won’t impress me as much as the previous one. But assumptions are wrong more often than not. It was as quiet as the previous monastery inside this one, initially. As we marveled at the architecture, the air slowly filled with a low hum. Gradually, the hum spread across and amongst us and it was all around before we realized what it was. The prayers had begun! It was a chant which grew louder every second before attaining a constant pitch and volume. There on started the melodious rhythm of hymns. We followed the sound and it led us to the main temple where perhaps hundreds of maroon cloth clad lamas sat praying. So deep were they engrossed in their prayers that they hardly saw us enter the room. The sound seeped in as we were busy admiring the lamas and their devotion; the magical element of it seemed to wash out all negativity. Choukling Gompa is another monastery located in Chougan. It is significant for being home to 8 enormous Stupas situated in the front. The monks were enjoying the pleasant sun set when I visited and greeted me with wide smiles. It was a day well spent. There aren’t many restaurants in Bir. Usually, one can have a small meal of momos and Thukpa, both of which are delicious enough at any place in the market. However, I had heard about a must-try experience at Four Tables restaurant. Frank, the owner, is a German who settled here a long time ago and runs an art gallery along with the small restaurant. All the food served in the restaurant is freshly made and you would have to order your meal a few hours in advance. There is no menu; you are only allowed to choose the type of meal you want to have i.e. Vegetarian, Chicken, Fish, or Prawns. Located at a 10 min drive from Bir in Gunehar, this café should be an inspiration to all mountain cafés. Except a dim orange light from a lamp which illuminated the room, the area was in complete darkness. Frank himself greeted me on the door. The table was set with a little candle in the middle. The meal served was continental and its taste was enhanced by the impeccable surroundings and the dotted sky outside. I returned to the place I had been staying at after the meal, thoroughly content. I like to remember my second day at Bir as one soaked in adventure. I had only seen Para Gliders flying away to the landing site since I had arrived at Bir and I had been quite apprehensive about actually pursuing the sport. I was informed one isn’t supposed to fly alone and there is a trained pilot accompanying one who flies the glider and one has to sit and enjoy the experience. This is when excitement trumped fear and I booked my Paragliding session for the afternoon. A clear sky helped me gain some confidence. 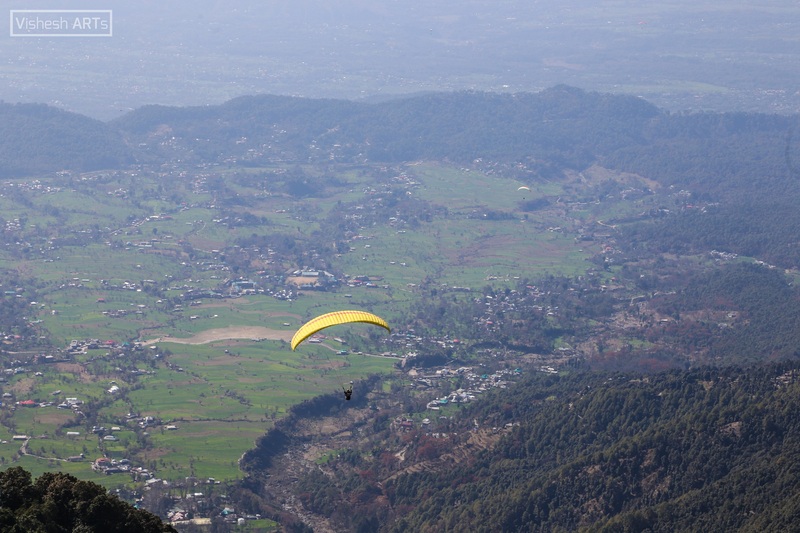 The paragliding launch site is located in Billing, which is 18 Km from Bir by road. One has to hire a cab to be dropped to the launch site. Alternatively, one can take a 3 hour long trek to reach the launch site and fly down to the village. After reaching the launch site, my fear tried its best to dominate my confidence and I almost thought of giving up. However, after being assured repeatedly and watching others take off one by one successfully; I made up my mind to go for it. Packed up with safety belts and being attached to the glider as well as the pilot, I was asked to run as fast as I can till I cross the edge of the cliff. I was supposed to be in the air automatically after that. Fear returned with its last pang when I was supposed to jump off the cliff but as soon as my feet left the ground and the weightlessness descended, adrenaline left room for nothing else. I shouted on the top of my lungs and sat comfortably after about a minute of being in the air. We rose slowly and gradually; the not-so-gentle wind hitting us across our faces. Looking around and being higher than the mighty Himalayas themselves can do wonders for you. My mind was devoid of all thoughts, all fears, and all worries. It knew it was flying and it did its best to absorb every view it could. Looking down at the village miles below didn’t invoke fear. Instead, it conjured a sense of accomplishment; of being above every earthly connection. After a smooth landing on the assigned site, I jogged all the way to my accommodation in the village, such was the rush. After taking some rest, I walked down to the market in the evening. I noticed that while it was hardly an hour after sunset, most of the shops were either closed or were about to close. This perfectly represented the simple life of the village. Except a few restaurants and little shops, there wasn’t much to visit. I came across a quite beautiful looking café on my way which goes by the name Garden café. The specialty of this café, according to me, was in spite of boasting of a large menu, they prepared every dish mentioned with fresh raw products. So by the time I arrived, which was late by Bir’s standards, raw products of only a few dishes were available. The food, as expected, was delicious and had freshness dripping from it. This was something common to the entire village; fresh and organic produce is what they believe in. As they say, all things have to come to an end. When they are as good as my trip to Bir, it hurts a little. But when you look back and think about the time you had and the memories you made, it all falls into perspective and we make the mistake of travelling to new destinations and look for new experiences again and again.